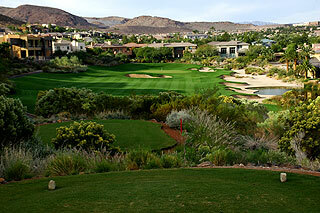 Home of the 2002 PGA Wendy's Three Tour Challenge, DragonRidge in Henderson is a semi-private course and one of the top golf experiences available in the Las Vegas Valley . DragonRidge presents the golfing public with a unique opportunity to play on a facility that features private, country club conditions and amenities. Until the membership base is built up here, anyone can schedule a tee time and enjoy a round. This "window" of opportunity is set to close on November 1, 2006 when the club will become private. The luxurious clubhouse measuring 35,000 square feet features a fully stocked pro shop and a snack area/lounge for quick food and beverages. A 2,000 square foot fitness club, gaming area, restaurant, spa, and men's/women's locker rooms are just some of the first class facilities that are included. On property at DragonRidge is an ample grass range - stacked with Nike balls and complimentary to guests, plus a putting green and a nice area for short game practice, which includes 2 sand bunkers. Every tee box here has a yardage plate, and sprinkler heads on the course are measured to the center of the green. 100/150 and 200 yardage blocks are also posted in the fairways, and 3 sets of pin placements are noted on an informational sheet on each golf cart. Also standard on each cart are ball/club washers and an ice chest, along with a ProLink GPS. 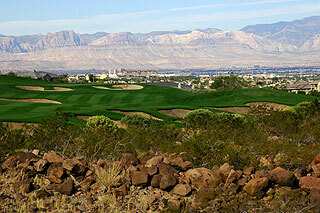 DragonRidge is located just 20 minutes from and features incredible views of the Las Vegas Strip. Sweeping elevation changes, natural canyons and preserved rock formations create an environment that provides a great deal of variety in shot selection. What's more, anyone - from seasoned golfers to beginning or resort golfers- will find this Jay Morrish/David Druzinsky design a challenging yet playable layout. 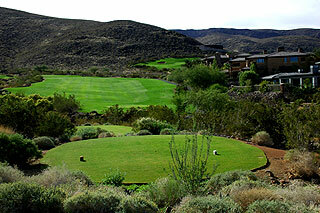 Generous fairways and landing areas are commonplace, and forced carries over desert are very reasonable. Water comes into play on just three holes, 4 sets of tees allow all levels of golfers an opportunity to choose distances that suit their game. Scratch players have over 7000 yards from the tips, and the forward tees measure 5040. 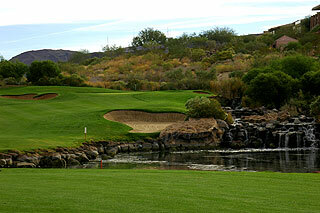 Mid handicappers can choose from the Men's tees at 5888, or play from the Cobalt tees at 6481 yards. The slope rating ranges from 142 to 118, and is 131 from the Cobalt and 122 from the Silver (Men's). You can get off to a good start on the front nine, as the opening par four is the number 13 handicap. The left side of the fairway, short of the bunker, is the best place from which to approach the green. From an elevated tee, there is a tremendous amount of room for error to the left of the par 3 second. Straight shooters should aim to the right side of the putting complex however, as a kick off the slope towards the center is the desired outcome here. Opposing wind may negate the downhill factor, so be aware. Number three features a wide fairway, with a challenging approach over a desert ravine which crosses the fairway about 20 yards out. There also is a short carry over a ravine off the tee on 4, which is a reachable par five for long hitters. Stay left of the bunkers which divide the fairway in two and the approach over another ravine about 50 yards out becomes easier. Note that the putts here will break towards the mountain on the right, even though it seems the slope is heading in the opposite direction. Deception on these immaculately conditioned putting surfaces is a common feature at DragonRidge. Pay attention to the starters advice - which may help you have more success on these challenging-to-read greens. Number five plays downhill, but into the prevailing wind. A creek that crosses just 10 yards from the double tired putting surface provides the challenge on this mid range par three. Long is better than short here. The par four 6th also plays into the wind, but there is plenty of room off the tee and to the left of the green on the approach. Land it on the fairway and this is one of the easiest holes of the round. 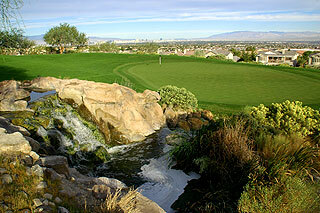 Number seven is a gorgeous golf hole, with cascading waterfalls part of the elaborate landscaping along the right side. This number one handicap is difficult to reach in two, except for long hitters or those hugging the water hazard on the right. The approach is at least 1 club uphill. There is more room than appears to be the case off the tee on eight. The fairway slopes right to left and the approach here is also uphill. This is a true 3-shot par five for most players, but is nonetheless a good birdie hole. The front side closes with a tough par four which features a plethora of fairway bunkers. Avoid them with a tee shot that covers significant distance and the uphill approach becomes less of a chore. The back side opens with one of the more interesting holes on the course. An accurate lay up with a mid or long iron will leave a challenging second shot that is all carry over a formidable desert ravine to a target green. It is easy to drive through the fairway along the right here, so play cautiously with your initial shot. On the approach, there is a little bail out area to the right. A wide fairway dotted with bunkers and an elevated green awaits on the par four eleventh. This is followed by an extremely challenging par five. It is easy to reach the ravine off the tee, so an accurate lay up (220 yards or so from the Cobalt tees) is called for. Only extremely long hitters will be able to carry this hazard. Another lay-up to about 120 out is the best option on the second shot, as the fairway narrows with rock outcroppings infringing on the fairway to the right. The third will be an uphill shot to elevated green with a deep bunker short right. Thirteen provides plenty of room off the tee, but an extra tight approach to a small putting surface that sits perched over a deep ravine leaves little room for error. The left to right slope of the green warrants your attention on the uphill par three14th. An extra club aimed over the left bunker is the recommended play here. After a short carry over a desert wash, number 15 bends slightly left to a putting surface that also slopes in that direction. Players from the Men's (Silver) tees catch a considerable break in yardage on this #4 handicap. The 16th doglegs left with a tee shot placed over the fairway bunker on the left side providing the most advantageous positioning. You have to trust this play on the blind shot off the tee. Stay on the fairway and the approach is quite simple. The easiest hole of the layout follows - the par three 17th. There is more bail room on the left than it appears from the tee areas, which are situated in desert patches 109 to 194 yards from the green. The downhill carry here is quite reasonable, but pay attention to the pin placement, as the green is quite large. A desert wash splits the fairway on 18, with the right side being the safest play from the tee. A lay up on the second shot, over the center fairway bunker will leave a challenging approach over a desert ravine which crosses about 50 yards out. This par five is a beauty, and a fair finishing hole. 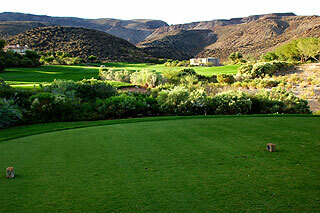 DragonRidge is a wonderful golfing experience. 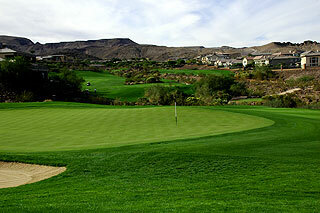 The conditioning from tee to green rivals that of any course we have played in the Vegas area. Most golfers will have the opportunity to hit every club in their bag, and everyone should enjoy the natural desert mountain environment. The views of the strip here are magnificent. With reasonable green fees for the area and top notch service - the Two guys Who Golf give DragonRidge our highest recommendation. 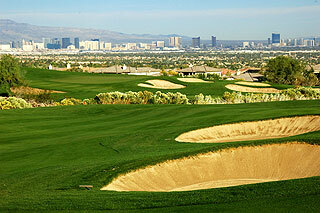 Call the pro shop directly to schedule tee times ( 702-614-4444).